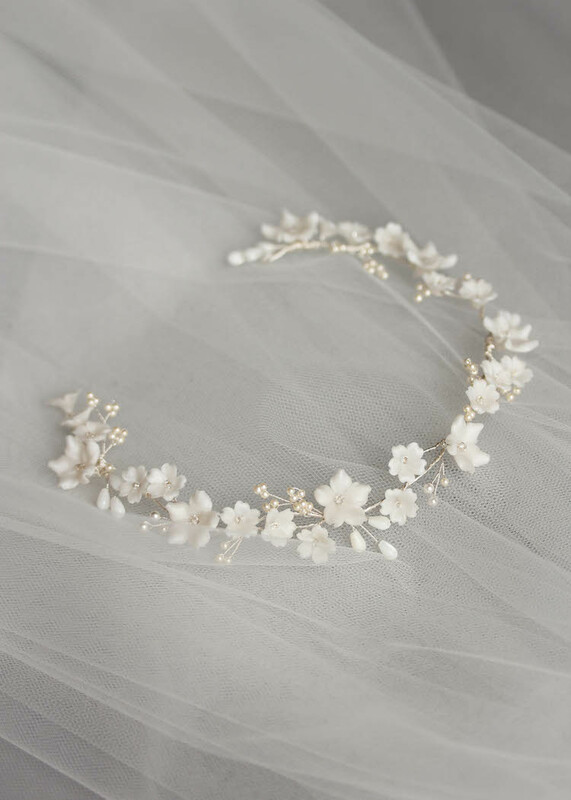 The Marjorie is a delicate and captivating bridal headpiece of sheer beauty. It features clay flowers in various stages of bloom that weave along your hair in the most effortless way. This softly spoken hairpiece evokes a relaxed and ethereal mood that doesn’t fail to impress. Simple and sophisticated, Marjorie’s feminine details contrast perfectly with modern wedding gowns and simple silhouettes. Pair this hairpiece with loose curls – either worn backwards to frame your soft waves or along the hairline as a headband. Featuring freshwater pearls, Mother of Pearl beads, Swarovski crystals and pearls, handcrafted clay flowers. Attaches to the hair with metal loops. Secure with bobby pins. The Marjorie headpiece is made to order. Please allow 3-4 weeks for production plus delivery times. The Marjorie headpiece is much loved for its soft ivory colour palette which feels timeless and elegant. It can be styled with wedding dresses ranging from off-whites to ivory to soft cream. Marjorie can be worn with or without a wedding veil. It’s a flexible metal piece that can be curved to the contours of your bridal hairstyle. If worn with a veil, style the Marjorie at the hairline as a headband. If you’d like to wear it facing the backwards, we recommend a veil with minimal gathers at the comb to ensure the delicate details of the headpiece show through. Browse our full veil collection or contact us and we’d be happy to offer a recommendation based on your wedding dress and hairstyle. The hairpiece can be made shorter, longer and/or wider to better suit your bridal hairstyle or head size. The details may be reworked with other details found in the collection, including possible changes to flower shapes or size. Details can be reworked into a new style – for example, a hair pin set or a crown with a higher profile.